Bramwells Demo Day - this one you won't want to miss, stunning papers from Bo Bunny along with gorgeous stamps from Inkadinkadoo amongst many other gorgeous things, so make it a date and drop in from 10am on October 17th to see what is going on, have been promised some photos so will post some sneaky peeks nearer the time so you can see what we're going to be up to!! Another fantastic class you won't want to miss out on on the 29th october is from Judy Laing, her designs are drop dead gorgeous and what this woman can't do with a pencil amazes me, so so talented. The only clue I can give at the moment is that it's going to be feeling a little autumnal!!! I might manage a sneaky peek or two but you'll just have to wait and see, but don't wait to book your seat or you might be disappointed. An in store class coming very soon is a Take One Stamp class, where you get your stamp in the bag of goodies, a Christmas themed class where you'll make 6 beautiful sparkly cards sure to please even Scrooge! 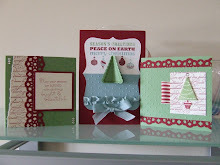 A bit closer in time is another demo from Squiggle Stamps and the gorgeous Tracy who will be showing off her latest designs and what you can do with them, we will hopefully manage to grab her on the 19th september (to be confirmed) so watch this space. Shop news, loads of deliveries expected in the next week so will keep you posted on what could be cardboard city if the wholesalers keep their word, new Christmas stock is already on the shelves and flying (sorry but this is only due to lack of cupboard space). One last thing - just a reminder that the Stampin Up catalogue will be renewed soon, so retiral lists will be available soon so don't forget to get in touch with Kara if there is anything that you really needed/wanted as if it is on the retiral list it won't be there long, and we all know that a Need is greater than a Want! Some future dates for your diaries!!!! Ring us now if you would like to come along to any of these classes, spaces are limited.